Hehe, now that I have the broadband at home, I really wanted to try and use it on Linux. I remember all those years ago when me and Gerald, with some help from John Kenneth would try to get onto the net with a stupid Winmodem!! Needless to say, it never worked. Have been waiting for this all this time and thank that Airtel also gave me an ethernet modem. Still had some problems installing and working on Ubuntu and after 2 days of research, I have finally managed to get the modem working and the connection setup. Thanks for all the help from the Ubuntu forums!!... Theres a screengrab on the post....and who else comes online as the first person to get this news - John!!! Hehe, thanks man!! Anytime bro :) . 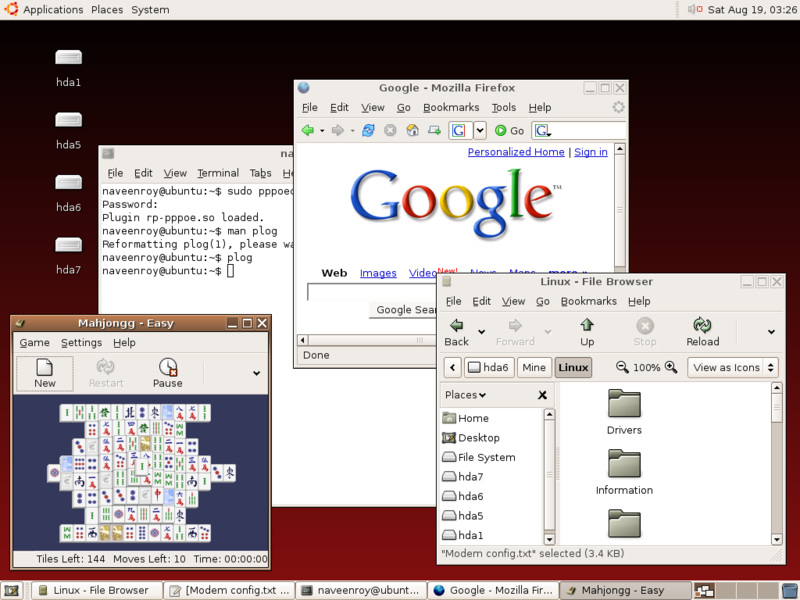 ..
Hey dude, inernet in linux... hmmm... sure that should be more interesting than the same on windows. You being sarcastic Zeon??? you don't know half of how tough it is to configure a net connection in Linux......even witha modem!!!! And its all because of the lousy attitude of the fu**ed up losers at hardware manufacturers......they will not let even hackers (thats a good term btw) get near the code to make a linux driver!! !